Genome scans can be employed to identify chromosomal regions and eventually genes (quantitative trait loci or QTL) that control quantitative traits of economic importance. A three-generation resource family was developed by using two Berkshire grand sires and nine Yorkshire grand dams to detect QTL for growth and body composition traits in pigs. A total of 525 F2 progeny were produced from 65 matings. All F2 animals were phenotyped for birth weight, 16-day weight, growth rate, carcass weight, carcass length, back fat thickness, and loin eye area. 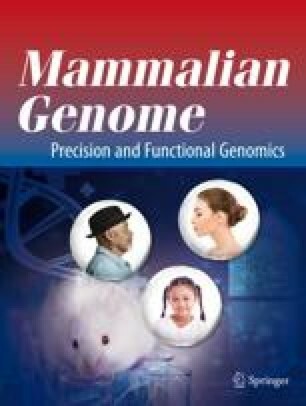 Animals were genotyped for 125 microsatellite markers covering the genome. Least squares regression interval mapping was used for QTL detection. All carcass traits were adjusted for live weight at slaughter. A total of 16 significant QTL, as determined by a permutation test, were detected at the 5% chromosome-wise level for growth traits on Chromosomes (Chrs) 1, 2, 3, 4, 6, 7, 8, 9, 11, 13, 14, and X, of which two were significant at the 5% genome-wise level and two at the 1% genome-wise level (on Chrs 1, 2, and 4). For composition traits, 20 QTL were significant at the 5% chromosome-wise level (on Chrs 1, 4, 5, 6, 7, 12, 13, 14, 18), of which one was significant at the 5% genome-wise level and three were significant at the 1% genome-wise level (on Chrs 1, 5, and 7). For several QTL the favorable allele originated from the breed with the lower trait mean.